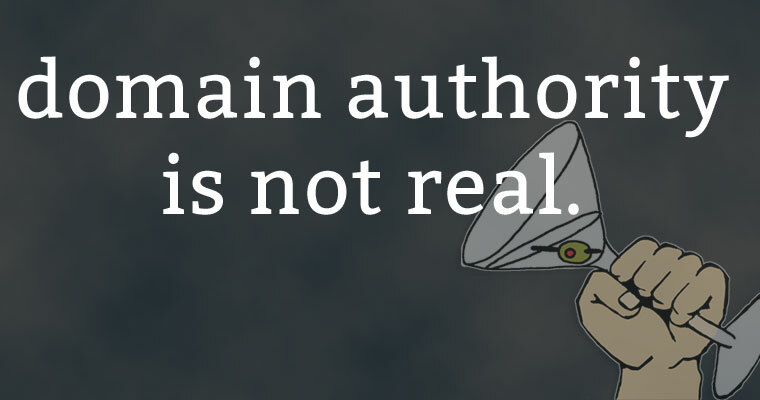 Many people assert that the concept of Domain Authority is real. But the fact is that there is no evidence that such a thing exists. People might shout out loud about it but what speaks the loudest is a link to a scientific citation or an academic or scientific research that supports the theory that domain authority exists. You’ll have to wait a long time though because domain authority simply does not exist as a factor in Google’s algorithm. The evidence is overwhelming that domain authority does not exist. I will show this evidence to you and I will show you what I believe is the best way to SEO. Do Inbound Links to Home Page Power Rankings? This is what the Domain Authority fuss is all about. There is a belief that if the overall link equity of a website will link power the rankings of the inner pages, that the entire site has link mojo that passes over to the inner pages. From Tumblr to Huffington Post to Forbes, wherever your link happens to be, there is an idea that the link mojo will pass through to whatever the inner pages link to. A link from one of those high “authority” pages are said to be worth more than a link from a “lesser” site with less link equity. And nothing can be more false. This article will link to authoritative resources so that you know it is not just my opinion but there are citations to scientific research and to patents that show that what I will explain is true. Returning to the topic of home page links, all links from the home page are relevant for whatever the context of the linking page is about. The inner pages could be about specific topic but the link to the home page will almost always be about the general description of what the site is about. For example, links to the home page of XYZ Hardware Store will be predominantly with the context of Hardware Store. Nobody will link to the home page with the context of toilet seat. Suppose you are trying to rank the toilet seat page. What makes more sense, drive ten toilet seat related links to the home page or drive ten links to the toilet seat page? If you drive ten toilet seat related links to the home page, what page do you think will start ranking, the toilet seat page or the home page? Neither! It’s a trick question. Quite likely neither page because the home page is not relevant for toilet seats. The inner page won’t rank for toilet seats because of toilet seat links to the home page because the link power is diluted. PageRank is divided by every link on a page, including the no-follow links. So if the home page has fifty links and one of them goes to the plumbing section, that means (lets simplify this), approximately 1/50 of the link power goes to the plumbing section. Let’s say that the plumbing section has another twenty links, including one link to the toilet seat section. So that 1/50th of a link is divided by 20, meaning that 1/20th of 1/50th of the link power goes to the toilet section. If the toilet section has fifteen toilet seats, then that link power is further divided by 1/15th. Do you see where this is going? The real-life scenario is even worse because every page has navigation links at the top of the page and more links in the footer. There could be an additional twenty links devoted just to navigation. And if you think that’s bad, consider that PageRank actually has a built-in dampening calculation so that the link equity actually decays by a certain percentage when it hops from one page to another page. Whatever link equity hits the home page just keeps dwindling and dwindling and by the time that link power makes it to your toilet page, well it’s not even a drop, not enough to circle your toilet drain. If you have a choice of a link from a low PageRank website with fifteen pages and about ten outbound links total and a high PageRank multi-thousand page website, I will take a link from the low link equity page to a relevant web page every time. Here is the deal: Every web page stands or falls on its own. You build links to your web page then that one web page will rank really well. Next step is to build links to other pages and those pages will benefit too. I have watched how the center of a site shifted from the home page to the inner pages in response to the link building. The whole idea that a non-relevant link is going to filter down to the individual web page and pass along link equity is laughably unrealistic if you simply stop to think about it. That’s my appeal to your common sense. But if you want hard proof, here it is. Gary Illyes remarked that Google does NOT use a domain authority metric. That statement from Google’s Gary Illyes should put a fork in the idea that Google has an overall domain authority metric. Anyone who does search marketing should investigate why they believe something is a ranking factor or important for SEO. If there is no proof then you should seriously consider dropping that from your beliefs. The fact that someone from Google says that domain authority does not exist should be enough but it’s good to dig deep for more evidence. A related concept is the mistaken belief domains have trust. The belief is that if you obtain a link from a “trusted domain” that some of that “trust” will trickle over to you. It’s really strange that this idea of domain trust is still around. There is no evidence that it is in use by Google or Bing. Googlers are on record stating that there is no trust metric. Many years ago domains could in fact trickle down ranking power. This is probably one of the sources of the idea of domain authority. Many web publishers complained that high PageRank sites like Adobe and About.com were ranking for a wide range of phrases with pages that weren’t really relevant. This is known as a search bug and it was fixed. Google was focused on Page level relevance as early as 2004. At SES San Jose in a session about bots/crawlers, circa 2004 Marissa Mayer answered one of my questions related to “powered by” footer links saying that it would not pass full PageRank if it was from an irrelevant page, even if that page was on a .edu domain. This is relevant to the idea of domain authority because I asked her specifically about the .edu component and her reply made it very clear that the .edu domain would not help a hypothetical web design site rank better (because it was on an irrelevant PAGE). This is just another piece of evidence of how linking power can work on a PAGE level, as far back as 2004. What purpose would a domain authority metric play in a world where search engines can map the web by a SECTION of page? You think a page level link graph is granular? Block Level link graphs are link graphs that map the web from sections of pages to other sections of pages. That’s even more granular than page to page link graph. This technology isn’t new. It was done in 2004. The idea of domain authority is rooted in speculation with no basis in any scientific research or Google/Microsoft patents. Just because others believe something, seek out the truth of the matter in the form of a patent or academic scientific research. 8. Are Domain Level Algos Biased? There is one algorithm that comes to mind that was purported to work on a domain level and it was discarded. That algorithm was Yahoo’s TrustRank. It worked with a hand chosen group of trusted domains that propagated trust. However, Yahoo TrustRank was subsequently demonstrated to be biased toward big sites and flawed. Wow, a bias toward big sites! Makes sense why this algorithm never made it into the real world. A better measure was a subsequent method called Topical Trust Rank. See also my article, TrustRank Teardown posted on TheSEMPost. 9. Do Links from So-called Authoritative Sites Help Rankings? There’s an idea that some sites are authoritative. It’s been fueling link selling for years and years. Google has been catching those links from at least 2005. It’s just one of many proofs that this thing that doesn’t exist called Domain Authority isn’t being passed. Here’s a post on Matt Cutts blog from 2005 where he notes that links from the Harvard Crimson news site was not helping a site rank. One would think that a link from a Harvard newspaper would help a site rank but that was in fact not true. Did not help. That post by Matt Cutts is also useful to show that what you think is helping a site rank is just an opinion. Opinions are fine but when discussing things like ranking factors, you absolutely must be certain that there is at least some evidence to show that something is at least within the realm of possibilities before you start making business decisions about it. If there are zero links to any research or patent to prove an idea is true, then odds are the idea is not true. Google’s John Mueller did Not Confirm Site Authority? Read the article and watch the Google Hangout video (video will start at 4:27) to confirm for yourself. This Google Hangout does not confirm a sitewide authority metric. In fact, the word authority isn’t even used. John Mueller only references using sitewide content to identify the “context” of what the individual new web page might be about. It has been suggested to me that Google’s Quality Raters Guide may outline a form of domain authority when it discusses Expertise, Authority and Trust (EAT). This is a good point worth addressing. EAT represents the kind of quality web pages that Google wishes to rank. EAT itself is not a quality signal and even less so, EAT is not a signal that is passed via links from one site to another, nor is EAT a signal that is circulated throughout a domain. As a model of a kind of domain authority, EAT is not it. EAT itself is a reference to a single web page’s expertise, authority and trustworthiness, as identified through various signals that humans intuitively understand (like user experience, etc). Is PageRank a Model of a Domain’s Authority? It’s worth noting that the word “authority” is not used a single time in the document produced by the founders of Google, Brin and Page, that describes what PageRank is. And the word “trust” is only used in the context of the word “trusted” and that’s in a paragraph about feedback from a trusted user. Does PageRank represent authority of a website? And in section 2 of the PageRank paper, as noted above, it states that Google uses links to “calculate a quality ranking” for each “web page” and that this ranking is called PageRank. Tired of 101 level link building tips? Roger Montti’s Advanced Link Building Newsletter delivers blow your mind link building tips not published anywhere else. WARNING: For Advanced Search Marketers only!